This is the all time classic trainer. Many thousands of R/C pilots had their first tentative flights with a Super 60 and in the midst of the bewildering number of 'trainers' that are available today the good old Super 60 is still going strong and is a far better model to build and fly than the 'horrible plastic clip together stuff" that promises much but delivers so little. 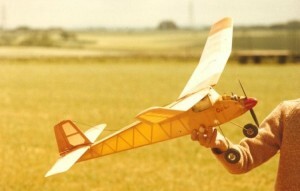 If you take the time to build your own model then the satisfaction gained from flying it is far greater than that of a so called 'ready to fly' model. 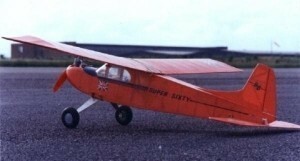 In England, the Super 60 is easily recognized down at the flying field and many R/C instructors will be only too happy to give you some lessons on it as they will be familiar with it and you will soon find yourself doing your own take off's and landings with no problems. And even if the model does get pranged then it can be mended because it is made from balsa and ply which can be glued and repaired. The Ben Buckle Super 60.....often imitated...never equalled! If the Super 60 is too big for you, try the Mini Super which is about 3/4 the size. 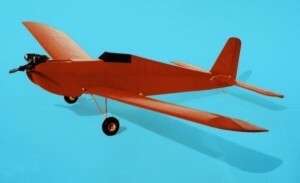 It has a tricycle undercarriage for easy take off and is ideally suited to engines .10 - .15 size, glow or diesel. The fuselage is proportionately wider than its bigger brother so that radio accommodation is simple. 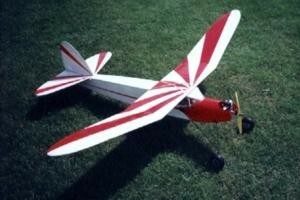 A great fun little model and inexpensive to get in the air! 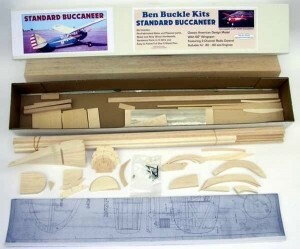 The Buccaneer Standard is another of Ben Buckle's early kits and the model itself was one of Ben's favorites. Ben had a free flight Buccaneer Std way back in the early 1970's, Colin Buckle can remember he and the two Ayres brothers chasing off after it at the Nats. at Little Rissington...."Ahhh my lost youth! Happy days indeed. Later on the Buccaneer was converted to single channel radio using a set that dad made himself with the TX mounted in a home made case which he cut out and soldered from a biscuit tin!" This kit is to the original 1946 specification, a true vintage model as designed by Albert Hatful. It has been updated only in order to make radio installation simple and it remains a very simple to fly and ideal introduction to radio controlled flying. It will of course fly itself leaving the pilot to simply steer it. 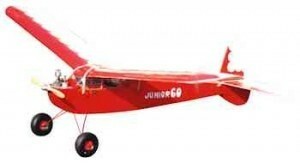 The Junior 60 proved to be so successful over the years that a 1.5 times larger version was the obvious development. This model has real load carrying ability and is the ideal platform for aerial photography. The wing is two piece making transportation simple even though the model is big. 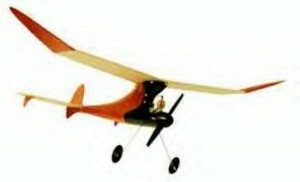 Junior 60 - Electric: The ideal electric model has a light structure and plenty of wing area. The Junior 60 fills the bill admirably. This version will ensure success with electric flight for either the newcomer to the hobby or newcomer to electric flight. Standard sized radio gear can be accommodated with ease and there is plenty of room within the fuselage for flight batteries etc. A simple structure, faithful to the original 1936 original by Paul Karrow, creates a delightful old timer. Even the reed wing tips are authentic. 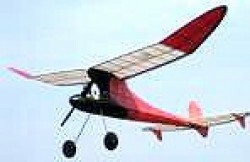 Very little power is required to fly this medium size model and you will be surprised at the performance it can turn in. 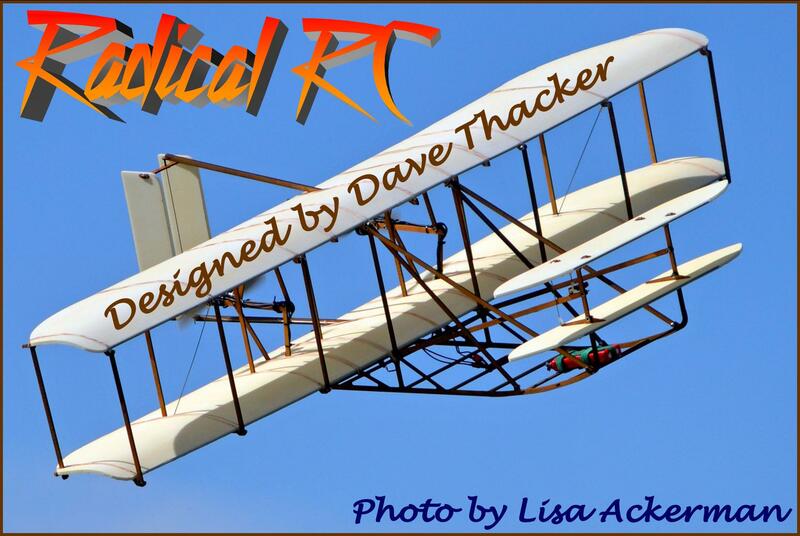 Tip dihedral and the long fuselage make this lovely model unmistakably vintage. It was designed in 1937 by Herb Greenberg a notable contest flyer of his day with many a trophy to show off. 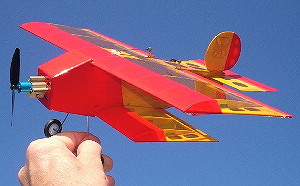 All modern contest power duration models employ the pylon wing layout. This was one of the first to define this very efficient layout and even today it can turn in a very good performance. Original design by Joe Elgin, 1938. There is always something elegant about elliptical wings. 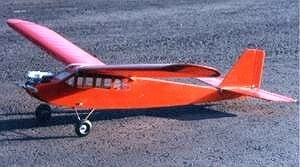 The Super Scorpion illustrates this superbly; every inch a light weight vintage model it requires very modest power to fly extremely well. Some models look right and this one definitely does. It was designed by Bill Dean in 1947and shows his design talent to perfection. 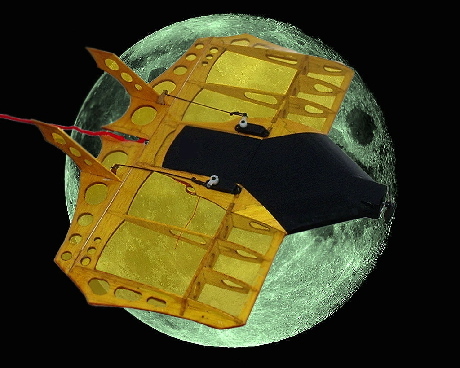 It can be built with straight vee form or polyhedral wings. This is a printed kit, parts are not pre-cut. 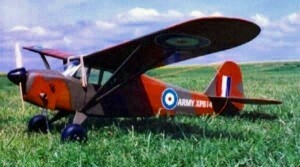 A semi scale model from 1941 based on the short take off and landing full size namesake. 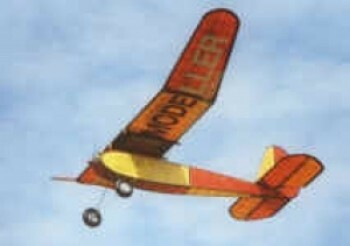 The model retains the ability to fly in and out of small fields. A classic vintage design and a very fine flyer. The kit is straightforward to build and includes hardware, covering material and pre-shaped wood. Note that this is a 'printed kit' with all the kit parts printed onto balsa and ply sheets so these will need to be cut out before building can begin. The Outlaw is the largest of the Outlaw Bandit Pirate trio and a fine flier for either free flight or simple R/C. The Outlaw has won many Flying Fifteen comps over the years. 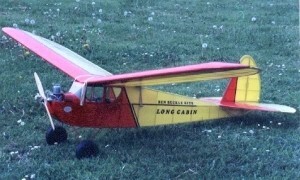 A semi scale low wing sport flier. 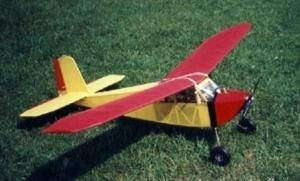 Quick and easy to build and lightly loaded giving stable flight characteristics. An ideal introduction to low wing models. This model lends itself to an interesting variety of color schemes. 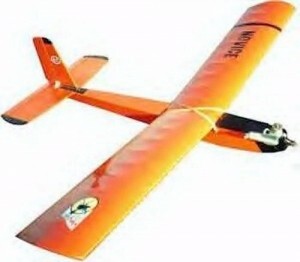 Span 50" (1270mm) Engine 1.5 - 2 cc 2 Stroke or Electric Free Flight or Simple Radio Control. Printed Wood/Panel Kit. Sid King the designer of the Novice (1975) is a very familiar personality in modeling circles with a well deserved reputation for quality designs. The Novice is very simple, it is hand launched and is suitable for the beginner. 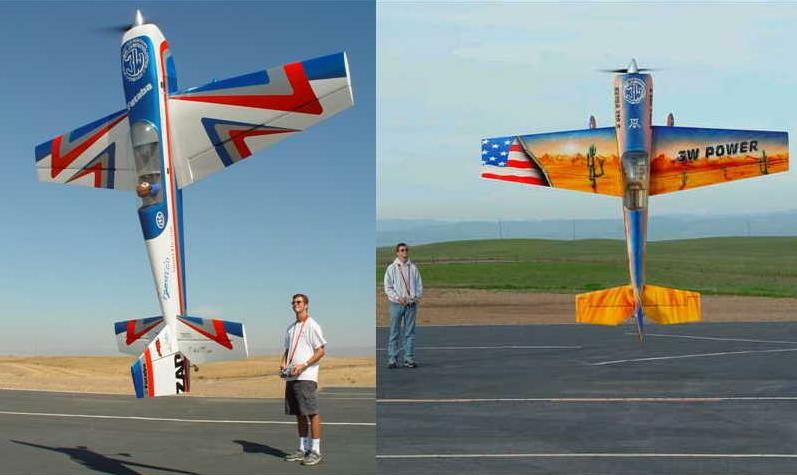 It can perform mild aerobatics on its diminutive .10 sized engine and for those who don't want an engine at all, it can be used for slope soaring. This would make a great Electric conversion. 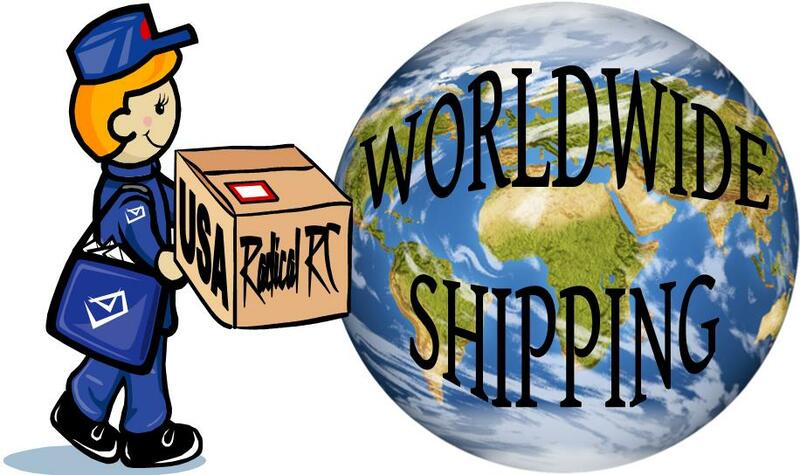 Call #937-256-7727 to learn how! 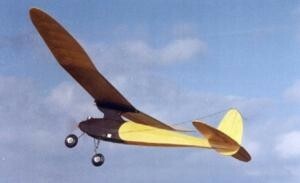 A great looking model in the air, lightweight and requiring little power to provide easy stable flight. 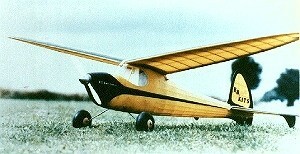 The model dates back to 1947 and is an Airtrails design.